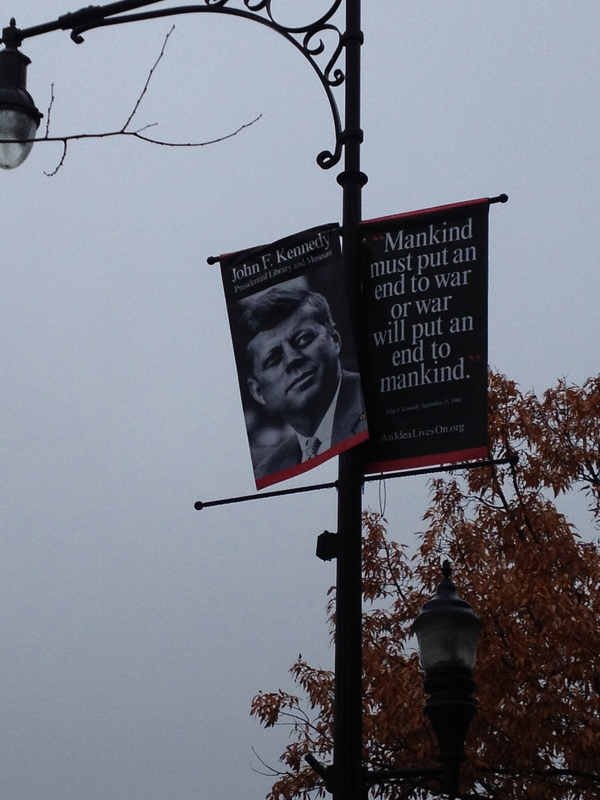 All along Harvard Street in Brookline, Massachusetts, the home of President John F. Kennedy, there are banners proclaiming some of his thought-provoking words. It is the 50th anniversary of his assassination, one of those moments of the last century, along with Pearl Harbor on December 7, 1941; the assassinations of Dr Martin Luther King on April 4, 1968 and Bobby Kennedy on June 6, 1968; the Challenger disaster on January 28, 1986; and in this century the bombings of the World Trade Center, the Pentagon, and the plane crash in a field in Pennsylvania on September 11, 2001, that will, for Americans, “live in infamy,” as President Franklin D. Roosevelt said about Pearl Harbor. All countries have these dates: for the UK in the last century they include the horrific battles of World Wars I and II; the death of King George VI in 1952; the Hyde Park and Regent’s Park IRA bombings on July 20, 1982: and in this century, the bombing of the three London tube trains and a double-decker bus by terrorists on 7/7/2005. There are times when the fabric of a nation is torn, and can never be mended; when there is a distinct “before” and “after,” after which things are never the same. The murder of JFK was one of these life-changing events. I was a young child when JFK was president, and I still remember very clearly how bright life seemed when he was alive, and how desperately terrible life became after he was assassinated. And now it’s the 50th anniversary. 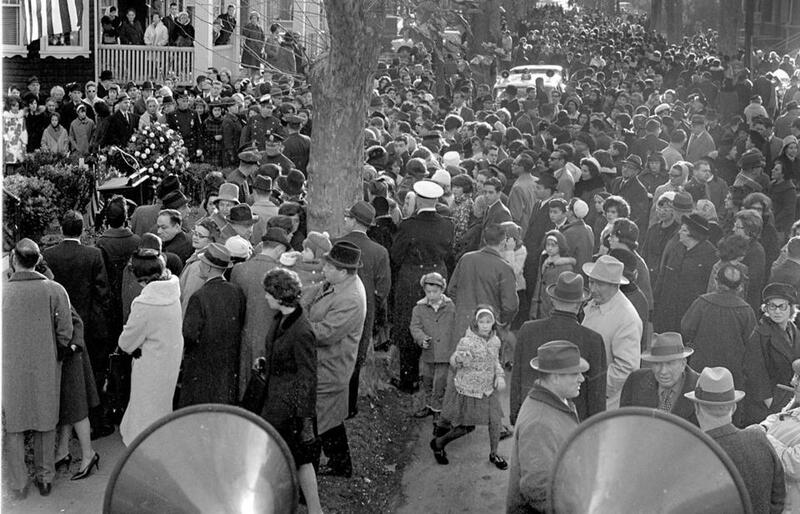 The Boston Globe did a wonderful piece today on the lasting effects of November 22, 1963 including this photograph of people gathering at President Kennedy’s birthplace on Beal Street, Brookline, Mass. This is what Beal Street looks like today; only I and a couple other people were out photographing, but reminders of that day were everywhere–in newspapers, on TV, and on social media. 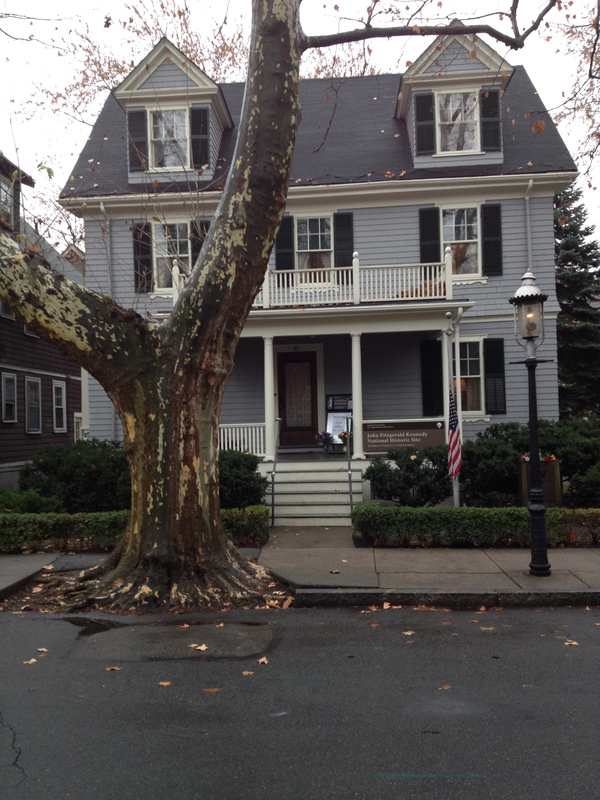 Pictured below is the house where JFK was born and lived as a young boy. 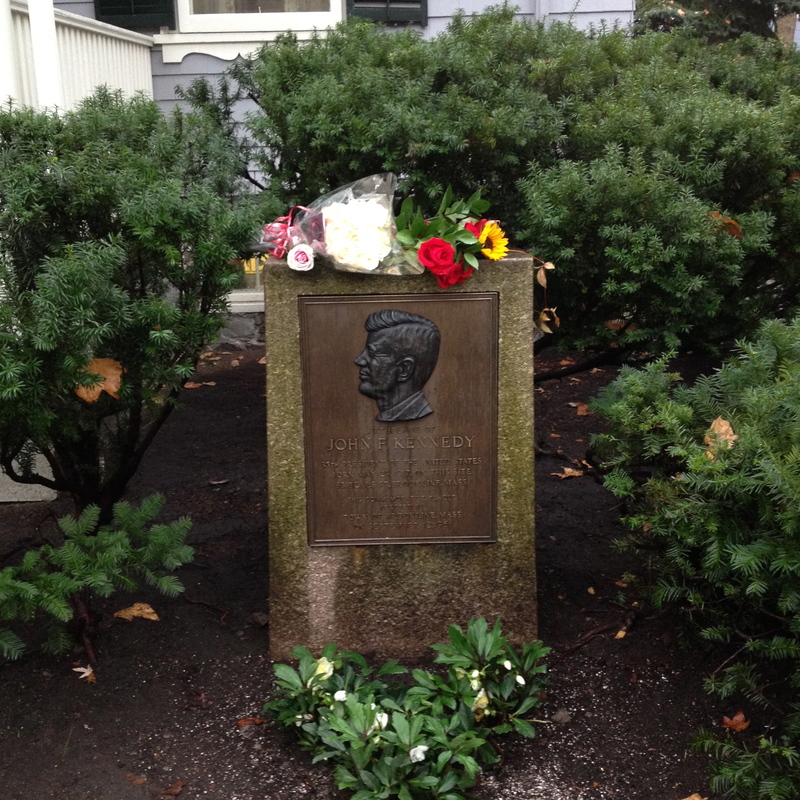 According to the Boston Globe, JFK and some of his siblings were born on a twin bed near the window in a room on the second floor, so the doctor could benefit from the light. The house is now owned by the National Park Service. JFK’s mother, the formidable Rose Fitzgerald Kennedy, has decorated it as it was when her children were young. Her recorded voice provides commentary as you go from room to room and marvel at how they fit so many people into that house. 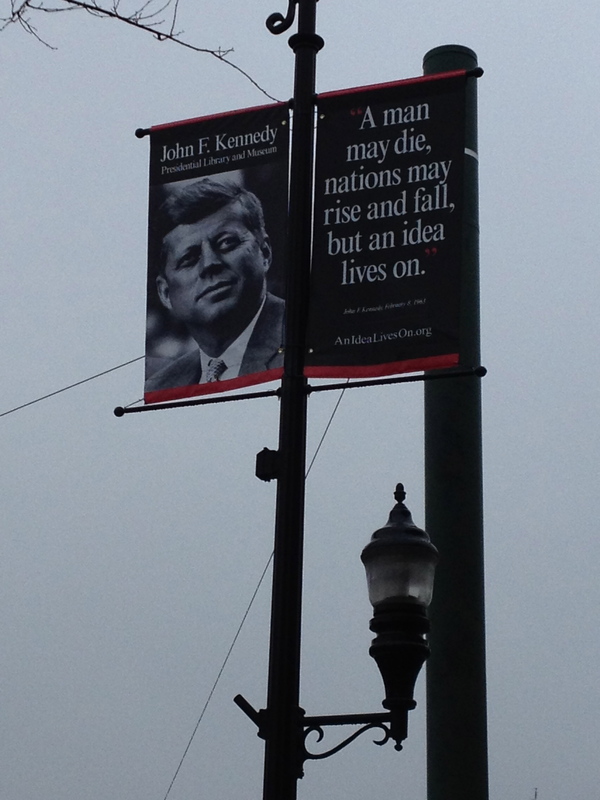 Today the American flag is at half-mast and there are flowers on the memorial to JFK. 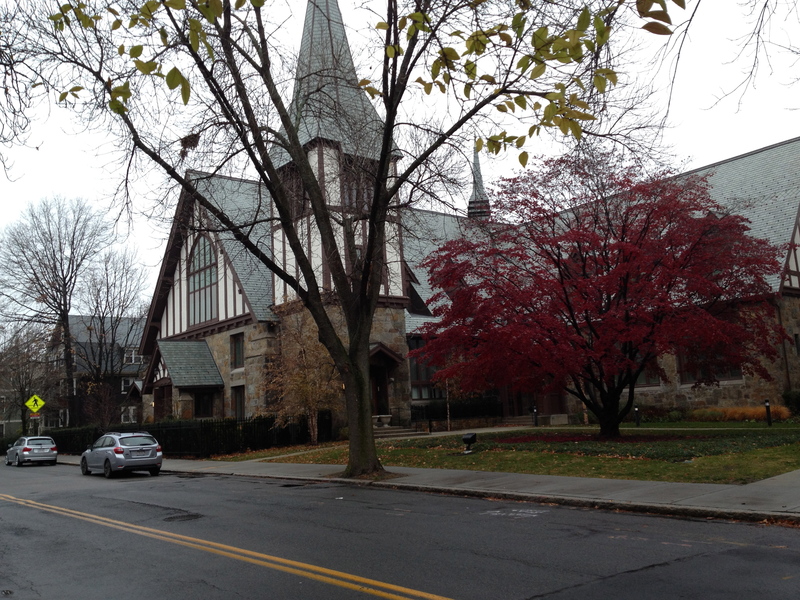 JFK and his family used to worship at St Aidan’s Church, about six blocks away. 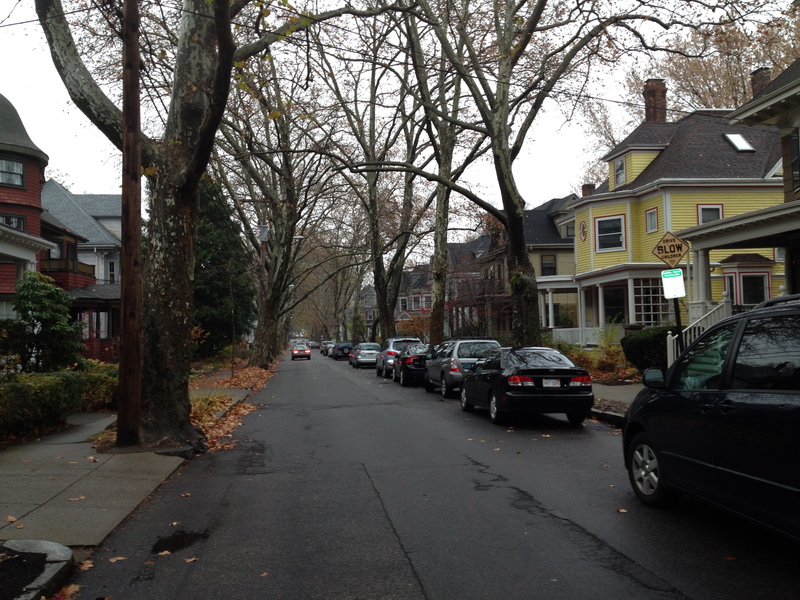 It has now been turned into condos, but still, the exterior remains, as do the magnificent beech trees (not pictured, but to the right of the church) that were there when JFK was a boy. St Aidan’s Church where JFK worshipped as a boy. Walter Cronkite of CBS News announcing the death of President Kennedy. President Kennedy’s funeral narrated by Walter Cronkite. President Kennedy, his brother Robert F. Kennedy, and Dr Martin Luther King were shining examples of the very best of America, and it is this we should remember, rather than the fact that they were taken from us far too soon. America has changed a lot in the past 50 years, for both good and bad, but some of the good is due to the work of these three men who tried to create a better, more equal, and compassionate country. What for you were the national events that made you feel that things would never again be the same?